A 30-foot sculpture of the Rev. Martin Luther King Jr.
is to be unveiled at a memorial to the civil rights leader on the National Mall in Washington. Neither line is at the memorial. My bet was safe. Fourteen quotes were chosen: inspiring quotes, of course, but inoffensive. The above lines assuredly did offend people, with swift kicks quickly coming from the establishment media and other guardians of probity. The electronic media took their shots as well. King appeared on ‘The Mike Douglas Show,’ where the host, along with nightclub crooner Tony Martin, posed questions designed to make King appear unpatriotic and unbalanced. The entire show, aired Nov. 2, 1967, can be found on YouTube. No deep thinking is needed to explain how the papers went from criticizing King in 1967 to rhapsodizing him in 2011. The antiwar King was an unruly irritant who saw his government as a ruthless menace to peace, fighting a war it couldn’t win or afford. Both the Times and the Post were early supporters of the Vietnam War, as they were of the 1991 invasion of Iraq and the 2001 invasion of Afghanistan. What King said in the Riverside Church sermon is as relevant today as it was then. Is it imaginable that if he were living now and beholding the Bush-Obama war policies in Iraq and Afghanistan, he would tone down his rhetoric and calm his fury? That’s no more imaginable than Barack Obama, in his next foreign policy speech, quoting the above lines of the antiwar King. That, too, is not a quote to found in the memorial. Nowhere to be found, either, is the word nonviolence. 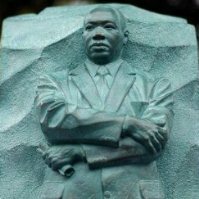 For the real King, the fiery and not the mythologized one, we’ll need to look beyond statues and find our own way to keep faith with his radical legacy. The memorial is on parkland near the Tidal Basin, between the Lincoln and Jefferson memorials. The Washington Monument and the Franklin D. Roosevelt memorial are nearby. ← What is the meaning of Joseph Campbell?